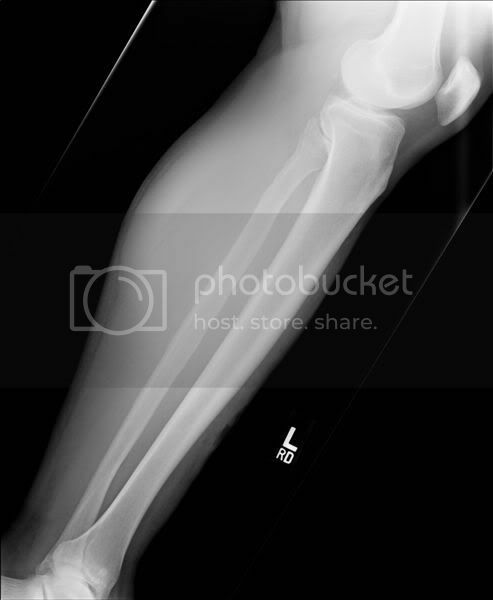 Status: offline 60 year old male tripped in his house 4 weeks ago and suffered a laceration over the anterior tibia. A week later the wound was not healed and he had pain and swelling over the anterior tibia. He is a smoker, obese, and has Type II DM. The wound still is not healed and he has had two separate surgeries for wound management. He now complains of a deep dull ache from the mid leg down to his ankle. Radiographs were obtained. Status: offline Im going with Chris on the osteomyelitis. Hes smart. I think what you are seeing is the overlying fibula. The osseous structure look ok to me, except a small ovid lucency at the medial malleolus (not concerning) however there is a soft tissue abnormality anterior to the tibia. Infection. Status: offline Osteomyelitis sounds about right. Ws there any fever involved a well? Periosteal reactions and soft tissue component (cloudiness of radiograph) as well. Thanks for correcting my apparent oversight. After looking at it again, I agree with you. I still think the OM may be an issue. Judging by these films, if it is OM then it's quite early because there are no visible (at least to me) periosteal reactions, but these may be better seen via CT or bone scan. Status: offline I see no evidence of osteomyelitis. The only abnormality I see is in the soft tissues. It is probably necrotizing fasciitis...just kidding. In any case, I'm sure Dr. Wagner could give us some valuble input on this one. Status: offline Interesting angulation of the proximal fibula. I am not sure if this is real or just the artifact from my lineless trifocals. Status: offline Leg looks swollen! Can it be some kind of vascular problem or infection of some sort...it could be osteomyelitis but the bone looks normal. Status: offline Any signs of compartment syndrome? 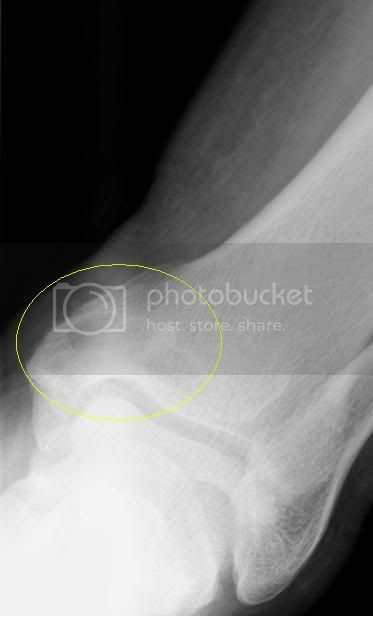 And that IS an interesting little curve in that fibula, but it looks old. Status: offline I think evolving osteomyelitis and compartment syndrome are very reasonable, taking into account the limited history and films that are presented here. The fibula is completely normal in these projections. Status: offline I don't see any signs of OM in this radiograph. Sure the patients history and presentation would lead my thoughts in that direction but there still appears to be pathology in the distal tibia. I don't think it is in the medial malleolus however but it does present (and appear) to resemble a Tillaux Fracture. Even though this is primarily an adolescent condition, I don't think it would be an unreasonable occurrence given this patients age and history. Status: offline Differentially I may also consider fracture of the Posterior malleolus (a.k.a. posterior articular margin) which may be more likely going by the size of the fx. and patients age. Status: offline FINDINGS: AP and lateral views of the left tibia and fibula were obtained. A lucent soft tissue defect is noted along the anterior leg in the mid to lower region. 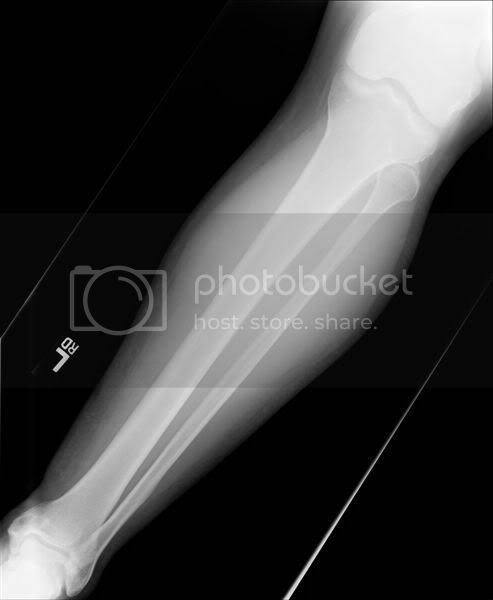 The distal tibia has an irregularly linear lucency measuring 3.4 cm in length, extending to the articular surface. There is intermixed lucency and sclerosis along the medial malleolus and distal tibial metaphysis. Diffuse soft tissue swelling is present. IMPRESSION: Findings in the distal tibia are concerning for osteomyelitis. A soft tissue ulcer is noted in the mid to distal anterior leg.